Our vision is to change the way people share their experience and tell their story. This is the first step on that journey. The abstract tells people about where you are now, what is a realistic progression in the medium term, and finally your ultimate goal. There are two abstract formats. Choose the format that best describes how you think about your journey and expresses your career priorities. I'm awesome at ... - Think about where you are now, what is a realistic progression in the medium term, and finally your ultimate goal. I want to help... - Think about where your passion is, who do you want to help? How can you help them achieve that goal? Which skills are you working on to do that? The abstract is the bit at the top of the profile. There are currently two formulas to enter, but we are always looking at more ways to express what journey you are on. This also includes your profile picture, a way for you to share your profile, and any links to other networks that people can find you on. to include work experience, education and courses, volunteering, and any side projects or hobbies that gave you skills to help you on your journey. don't focus on the what of the day-to-day activities - we get that from your resume - concentrate on the why you did things, what your goals where, and how what you did helped. Here is an example. Think of the title as the chapter heading in your life story. The descrption is then how you would describe this era to someone you have just met. 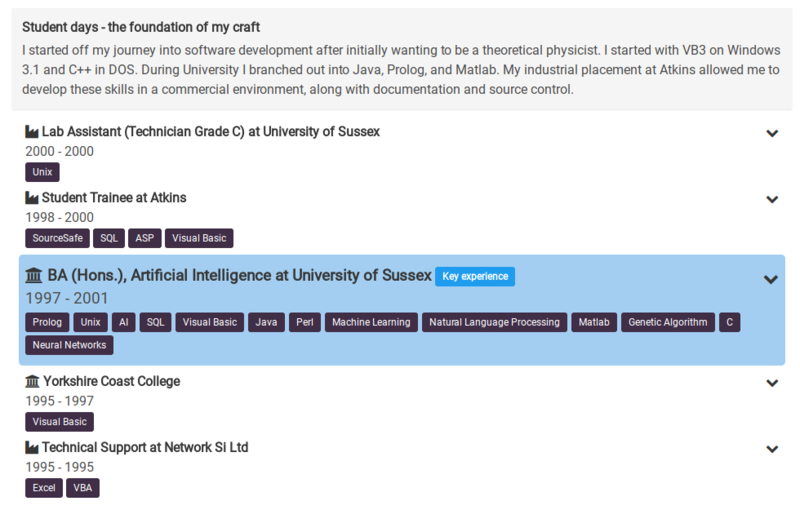 The tags under each area of experience allow you to highlight the skills that are applicable. This will be used later to help generate skills based profiles dynamically. You can also highlight one piece of experience in each era as "key expereince". Remember the experience that you add doesn't have to be just jobs and education from your CV, with our integrations you can add Flickr photosets, GitHub repositories, and more! On our roadmap we will be adding further support for CV imports, as well as importing your profiles from Facebook and Google+. We also have the ability to adapt different version of your profile, called lenses, to highlight experience in a particular area, and then share those as well. This is described below. This creates a view that tailors your profile for a specific purpose. This gives you a URL that you can share that will only contain the Era text and experience that you select. If you do not select any experience in an era then the era description will be hidden. Highlight your experience or education depending on what your needs are, without more data entry.